Well-fitted clothing is a sure way to infuse your professional look with timeless, effortless class. So, what does every man need to understand in order to shop for flattering suits, shirts, pants - and more? The short answer is proportion. But beyond that, it's about being in tune with your body, specifically, having a sense of your unique shape, weight and height. In this article, we'll explore five classic body types - short, tall, large, athletic and slim - and how to best dress them. - Avoid longer suit jackets, which will make your legs, and overall form, look shorter. - Shop for short-length, tailored suits. - Thin, vertical pin stripes will have both a slimming and elongating effect. - Purchase suit jackets that expose some shirt cuff; this lengthens the appearance of your arms. - Buttons placed slightly lower on a suit jacket elongate the torso. - Do not wear heavy, bulky accessories. These will look out of place and disproportionate. - Wear slim, narrow shoes. - Do not purchase oversized suits: a common error made by tall men. These will not account for a possible athletic or slim frame and therefore, can often look baggy. - For more casual wear, a cuffed hem can add style to your look. - Avoid thin, vertical pin stripes. These will only lengthen your form. - Experiment with prints, textures, and accessories. If applied correctly, these may enhance your personal style and complement your outfit's proportions. - Opt for a shoe with a rounded toe. - Sometimes, a tall man's tie may lay quite short in the back, and cannot be secured in place with the loop. This can be corrected by your tailor. - Opt for darker color fabrics, which have a slimming effect. - Avoid bold prints and textures; these can add weight to your look. - Do not wear a larger suit; it will only look heavy and baggy. Instead, choose a suit that is well-tailored to your form. - Take care to tuck in your shirts. Untucked shirts can lay tighter at the waist and looser at the hem, which can look unflattering. - Ties, pocket squares, and watches are stylish, eye-catching accents. - Keep your jacket buttoned, unless you're seated. This will keep your shape streamlined. - Choose sturdy, well-soled shoes. - Avoid suits with thick shoulder pads; your shoulders are broad enough. - Do not choose oversized suits simply because you have a wide chest; they may look fitted in one area and baggy in others. Opt for a custom-made suit that takes into account your specific proportions. - Pay attention to the circumference of your collar. You may have to choose a lower collar. - Choose a classic, versatile shoe silhouette: one that is neither too bulky nor too slim. - Do not wear wide ties. - Opt for lighter fabrics to add presence and style to your look. 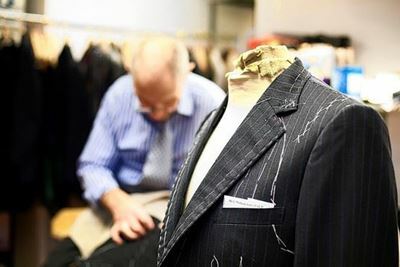 - Choose slim fit, preferably custom-made suits. Padded shoulders may benefit you. - Avoid vertical pin stripes; these may further slim you. - Play with prints and textures. These can add more dimension to your outfit. Plaid and horizontal stripes are particularly flattering on a slim man. - Do not wear heavy, bulky accessories. - For a more casual look, leave the top few shirt buttons unbuttoned. This will help widen your shoulders and broaden your chest.